TOPEKA -- In 12 games this season opponents haven't presented Bishop Miege with much adversity. On Saturday in the Class 4A-1 State Championship, Hayden provided adversity and them some as the Stags had their hands full most of the afternoon. Miege fell behind early and had leads erased on two occasions, but overcame those obstacles to defeat the Wildcats 42-35 and claim the state championship. "I'm proud of these guys, we haven't been tested like that all year long," Miege head coach Jon Holmes said. "We didn't know how we were going to respond. I looked the kids in the eye at halftime and said 'what are you gonna do?' This feels awesome, we've worked really hard. 13-0 with this group of kids is just special. It means a lot to the school and community." Miege found themselves in unfamiliar territory in the first quarter. The Stags turned the ball over on their first two possessions and while Hayden had a turnover of their own, the Wildcats were able to take the early lead. 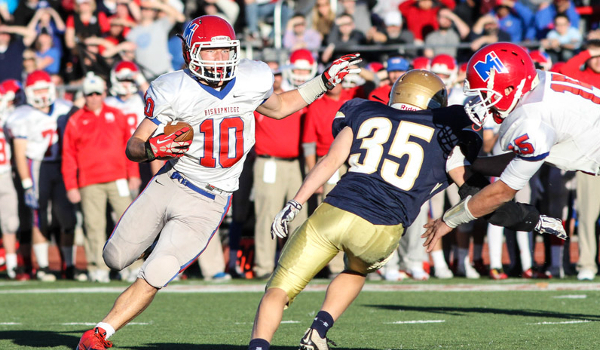 Miege looked poised to turn their opening drive into points, but a fumble thwarted those plans. The Stags regrouped and returned a fumble to the Hayden 28 with 6:06 to go in the quarter, but on the very next play the Wildcats picked off a pass at their own 3. Hayden turned the INT into points after converting a fourth down in Miege territory. The Wildcats cashed in with a 17-yard pass from Jacob Head to Noah Huston with just over one minute left in the quarter. Miege responded quickly as Dawson Downing scored his first of two touchdowns in the quarter just 35 seconds into the second. Hayden continued the back-and-forth affair with a rushing TD of their own to go up 14-7 with 7:34 left in the half. Miege's special teams provided a spark as the Stags were ready for a Hayden punt fake with just over five minutes left in the half. Miege dictated the pace the rest of the half, scoring twice. Ryan Willis hit Jafar Armstrong for a 22-yard TD (14-14) with 2:55 left and Downing gave the Stags the momentum at the break with his second rushing score (21-14) with just 18 seconds to go. Miege's lead quickly disappeared as Hayden took the opening second-half possession down the field and tied the game at 21 on a TD pass from Head to Zach Roush. The Wildcats recovered the ensuing kickoff, but Miege's defense turned them away on downs. The Stags went back ahead (28-21) on a big third-down conversion, a 76-yard bomb to Armstrong, but Hayden converted a third down of their own on their next drive which went for 80 yards and the game was tied (28-28) again. Miege had another answer and this time remained in control following this momentum shift. The Stags scored with under one minute to go in the quarter as Downing scored his third touchdown of the game to put the No. 1 team in Class 4A-1 up (35-28) for good. With under eight minutes to go in the game, Willis threw his third TD of the game to Nolan Gray and it was 42-28 Miege. The 14-point lead was sufficient for a Stags defense who, as they have all season, came up with stops when the team needed them most as they only allowed a score with under one minute to play the rest of the way. "We made some early mistakes and the game was chippy throughout, but we really came together and made some plays as a team," Miege senior quarterback Ryan Willis said. "We haven't had a close game all year, but I knew it was going to be a close game. They (Hayden) didn't make it to the state championship for no reason. They are a good football team, a lot of credit goes to them. They really gave us a run for our money." Miege slightly outgained Hayden (474-465) and was led by Willis (15-23, 315, 3TD) and Armstrong who caught eight balls for 220 yards and two touchdowns. Downing ended the game with 151 yards to go along with his three scores. Head threw for 417 yards (31-51) and four TDs for Hayden (11-2).